Apple dips its toes in Black Friday with its very own shopping event. If you're familiar with Apple (who isn't), you'll know discounts and offers is something the company very rarely offers. 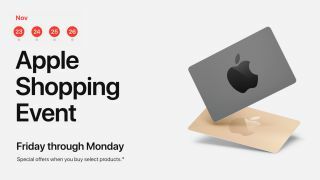 But, not ones to be left behind, Apple is getting involved with Black Friday and Cyber Monday with its very own shopping event, offering gift cards up to $200/£160 with purchases on select products. The offer doesn't knock any money off the product prices, which comes as no surprise, however, if you're in the market for a new Apple device, the gift card comes as a nice bonus - and one you're unlikely to see again in the near future. Want more Apple offers? Check out the Apple shopping event in full right here.